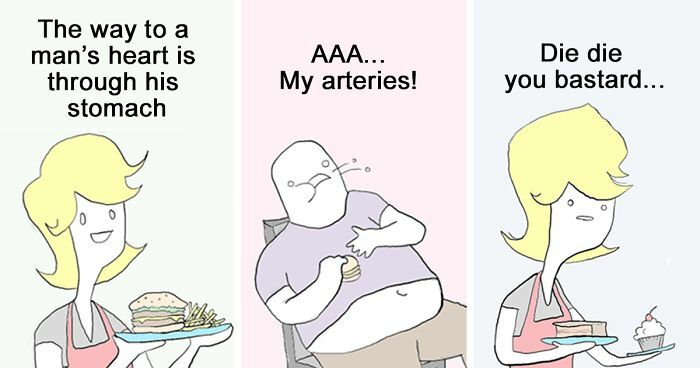 Extra Fabulous Comics talk about the darker side of everyday life in a hilarious way. Their creator Zach started the series back in 2011 and it has been steadily growing ever since. These brief comic strips often point out the absurdity of life, criticize human behaviour or simply explore silly situations. "Having a comic is a pretty intimate thing," Zach said. "It’s like a diary full of wieners and poop jokes that I enjoy but am afraid if people read it, it will reveal some level of mental illness that I’d rather have kept a secret." Many people believe this is the actual cause-effect chain. Caught pondering over a curious volume of forgotten lore. Somebody should buy a vowel! Those aren't spiders, they only have six legs! Also, no heads? ... and take your glasses off! Lol sums up my last relationship. Honesty is an important part of a relationship. I love that it is a P.P exam. Lol. Her: "I think we should see other people.."
i hate those little motherfuckers so much. lol, his eyebrows look like APH England's. Unda da sea, unda da sea! Fishes are drowning, smoking their browning, unda da sea!!! Thomas the kill engine. coming this summer. see? no death threat by Christians because of blasphemy. i talk to people only after i drink my coffee. i hate coffee. he just got pooped on. I admit, I love pointy-finger guy.